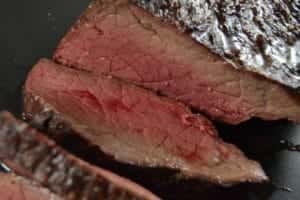 One year ago I wrote an article on smoked moose roast. That was low and slow all along. This time I decided to grill it without smoke. Low and slow still. That’s the way on roasts if you want to keep them juicy and tender. I think I am stuck with reverse sear method. It works for any meat but especially for roasts. Reverse sear means starting the grilling by indirect heat and searing at the end of it. Not vice versa, which I guess have been the traditional and most applied method. In my experience, reverse sear secures more even doneness. Try it out and see how you like it. This time my moose roast was 3,1lb (1400g) cut. Few hours prior to grilling, I removed thin membrane and few hard lumps of fat with a sharp knife. Then seasoned it with salt, pepper and juniper. I like the taste of moose as such so I don’t go wild on herbs. Rosemary and thyme goes well with venison also, but now I kept it simple. I prepared my Weber Master Touch grill for indirect cooking by placing lump charcoal on the other half of the grill, while other half was left empty. Then ignited the charcoal with two lighter cubes. When grill temperature got close to 265°F (130°C), it was time to place the moose roast on empty side of the grill grate. Again, good quality thermometer is a must for following the progress. It took 2hrs for the meat to reach 130°F (54°C) inner temp. I moved the roast on top of the hot charcoal for final searing. About a minute of searing all sides was enough for beautiful color for the surface. I wrapped the roast on foil and gave it good rest for 15 minutes. During that time, inner temp carried over to 140°F (60°C). 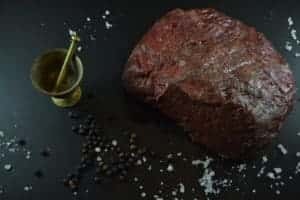 Desired medium rare doneness. Try oven cooked root vegetables with moose or any venison. Works every time.